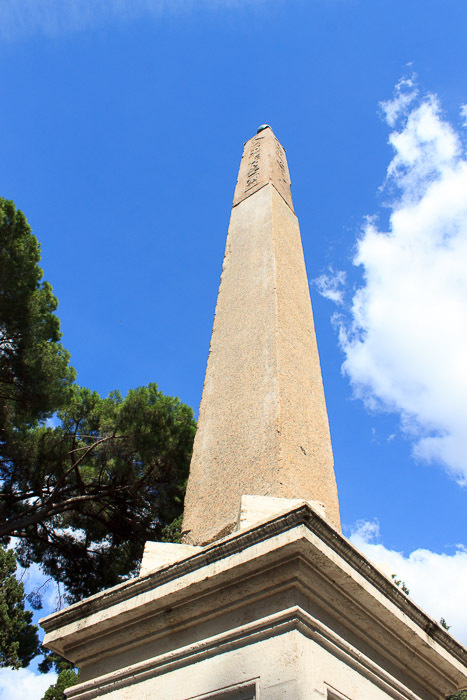 The Mattei Obelisk is 8.8 feet tall (40.1 feet with base), is covered by hieroglyphics, and is now located in Villa Celimontana, south of the Colosseum. I'd guess the park might be closed and locked at night. This is the smallest of the ancient Egyptian obelisks, and is also the most battered and the hardest to find. The park can be quite a hike to get to, depending on the route you select. The shortest route from a metro stop is from the Colosseo station. Walk 180 degrees around the Colosseum, then down Via Claudia. Just past the Santa Maria in Domenica convent is the entrance, on the right, into Villa Celimontana. The obelisk was originally erected by Rameses II as one of a pair at the Temple of Ra in Heliopolis, the other being the Macuteo Obelisk which retains much more of its original height. It was brought to Rome by Domitian in the late first century AD and erected in the Temple of Isis (a long-lost temple near where Santa Maria sopra Minerva now stands). It was found in the 14th century and erected east of Santa Maria in Aracoeli on the steps of the Campidoglio until some time between 1555 and 1561 when it fell. Michelangelo redesigned the Capitoline square in the late 16th century. It was given in 1582 by the city authorities to Ciriaco Mattei, who set it up in the Mattei Gardens (now called Villa Celimontana), There, it collapsed again and lay forgotten until 1820 when the upper part was erected where it still stands on a modern base made from parts of several unknown obelisks. During this job, one of the workmen lost his hand when a rope broke and the obelisk fell onto his hand, amputating it. That hand is presumably still under the obelisk. 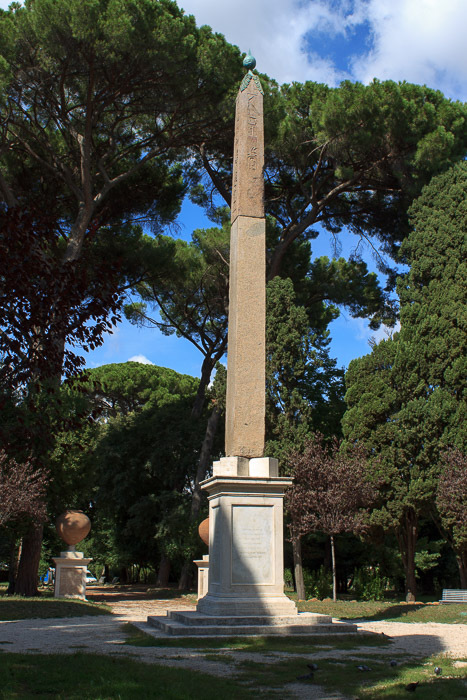 See all Mattei Obelisk photos.